The members of I-Witness Video have been appalled to see a high level of violence directed against peaceful demonstrators, medics, legal observers and journalists at the Republican National Convention in St. Paul, Minnesota. Concussion grenades, smoke bombs, CS gas (tear gas), rubber bullets and pepper spray were used to attack and herd demonstrators. In particular, pepper spray was used excessively and indiscriminately to torment and punish demonstrators in a manner that violates widely accepted law enforcement standards. In one instance a man was pepper-sprayed while handcuffed and then punched in the kidneys. Peaceful demonstrators have been restrained and forced to kneel on pavement for hours after being pepper sprayed without being given medical attention. In another instance where pepper spray was used to preemptively punish a person who was perceived by police to be a protester, a lone street medic was entering her car when police drove up, sprayed a small fire extinguisher sized canister of pepper spray into her car, completely soaking her head to toe before driving away, leaving her gasping for air and collapsing. The medic was neither arrested nor charged. The treatment of arrestees in the jails has been shockingly bad, even grisly. Medical care has been withheld from many arrestees. In one instance a hemophiliac was offered gauze as treatment for a wound. Elliot Hughes, a 19-year old arrested while bicycling, was forced to wear a bag over his head while being gagged and beaten. The punishment of arrestees did not end at the jailhouse door. In almost every instance, the Sherriff’s Department did not return any personal belongings to arrestees upon their release. Many, including under-age women and girls, were put out in the cold in the middle of the night wearing thin prison-grade shorts and a white t-shirt. Some were dropped off as far as five miles away from the jail without their house keys, car keys, cell phones, identification, or money. In some instances this meant that they were not able to access critically needed medication. Many journalists working during the period of the RNC experienced obstruction, harassment and arrests. Thirty journalists were arrested including reporters from ABC News, Fox News, and Indymedia. On September 1, Sharif Abdel Kouddous and Nicole Salazar, two producers from Democracy Now! were slammed on the pavement and against the wall, arrested and charged with a felony riot. Democracy Now! host Amy Goodman was also arrested and charged with interfering with a police officer. On September 4 Kouddous was arrested again, along with Democracy Now! producer Rick Rowley. Members of I-Witness Video were visited by the FBI and a Wisconsin sheriff, were falsely arrested without charges being filed, underwent a search under an invalid warrant, were threatened on the street by police officers, extensively surveilled by police officers with video cameras and followed by undercover officers. Two days before the convention opened, St. Paul police surrounded the house we were staying in, effectively placing us under arrest for two hours. When a search warrant was finally produced, it was for the wrong house. When we declined to allow them to search our house under an invalid warrant, they broke in and held us at gunpoint. We were handcuffed behind our backs and held in the backyard while the house and our belongings were searched. During the same period three other member of the collective were detained while leaving the area on bicycles and two others in a car were pulled over and detained for four hours. In a sinister progression of events, police officers arrived at our office building four days later with batons at the ready, carrying a battering ram and alleging that we were holding people hostage in the I-Witness Video office. A prompt response by National Lawyer’s Guild attorneys thwarted further police action. The unfounded and absurd allegation by police that hostages were barricaded in our office could have allowed them to enter our office without a warrant and possibly even shoot us. Please check the I-Witness website for updates - we will continue to let you know more about the 2008 RNC and DNC as we investigate further. Sometimes it’s not the squeaky wheel that gets the oil. “MINNEAPOLIS, MN — They weren’t carrying signs. They didn’t have loud speakers. They didn’t even need a group of guards in riot gear to make sure they didn’t get out of hand. No, not the RNC. 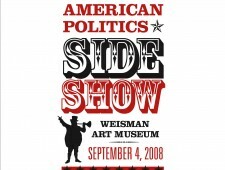 On the way to Peace Island Picnic, stop at the Weisman Art Museum for a day of the American Politics Sideshow. Mingle with giants, hoola hoopers, and musicians. Expound on any subject on THE AMERICAN SOAPBOX. Take a citizenship challenge and win fabulous prizes. Hear discussions with ethnic media covering the RNC. Buy food from the upscale chef shack. Hear lectures on art and politics, and see Presidential reenactments and films reflecting America today. In the galleries, view Luke DuBois’s exhibit “Hindsight is Always 20/20,” which muses on presidential vision and rhetoric in presidential State of the Union speeches. Also view “Who is a Citizen ? What is Citizenship” featuring American art of the last century. Events occur from late morning until after dark.